Make every get-together delicious. 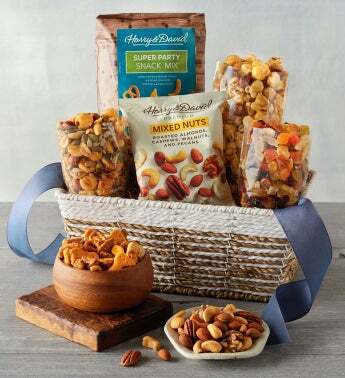 This Snack Basket is brimming with our most popular snack mixes, caramel Moose Munch® premium popcorn, gourmet dried fruits, and tasty mixed nuts to share and enjoy. Everything arrives in a reusable basket and is finished with a beautiful blue bow.